This narrative that SUCCESSION is not the solution is a lie from pit of hell. From our History book when Biafra was declared 1967 by The People's General Dim Ojukwu who reacted based on the collective will of Biafran people. It will interest you that, Dim Ojukwu with the Biafra council were able to put the Best brain you can think of "Biafra Scientist. " The Biafran Scientist did wonders, according to C. C. Onu, it took two months for Biafran scientist to produce the most dreaded weapon during the way, it is a privilege to come across a long speech made by Dim Ojukwu where he said, Biafrans produced their own rockets that they launched and guarded to their targets. Any history student, will agree completely that Biafra is tested and trusted, if as far back from 1967-1970 the Biafrans could refined their own aviation fuel, it will interest you to note that aeroplane was converted into fighter jet, only Biafrans could do this even facing a heavy serious attack from jihadist Nigeria govt along blood thirsty British. 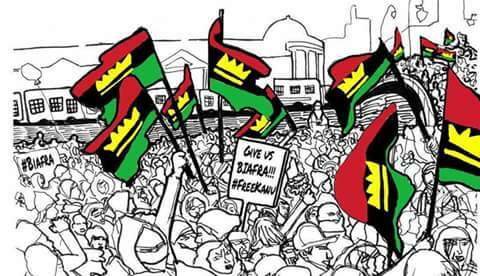 Merging Biafrans with Arewas and Oduduwa was for the greed of British and islamization of Igbo Jews, a clear study of this mere geographical expression called Nigeria from 1970 -2019 can’t burst of producing pencil, the poverty rate is very high and yet to refined her own crude oil like the way Biafrans did for many years ago!! !